Happy Monday! Time for Part Three in the Vegas 2012 edition of the Single Malt report. Adam had told me, before the tasting had begun, that due to my palate preferences we would be heading towards the extremes of the whisky world. Now we were at the midpoint of whiskies. There had been great finishes: madeira on Irish, rum on Scottish; and there had been a massive spicy rye. But what about the single malt's spirit itself, what journeys awaited? The Island of Mull sits south of Syke and north of Islay. A single distillery has operated on this rocky island, on and off, since 1798. It's been known as Tobermory for the majority of its existence, but also went by the name Ledaig for twenty years. Currently Tobermory produces its namesake unpeated malt as well as "Ledaig", a considerably peated malt modelled after the whisky that had been produced on the island many years before. 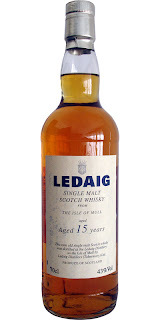 Ledaig is a bit of a curio since it's not hot and peppery like Talisker to the north, nor is it medicinal like the distilleries to the south. ...The bad news? Ledaig 15 was produced in limited amounts for a limited time and no longer for sale anywhere, except at swollen auction prices. It was a great pleasure to have had this opportunity to taste it. India? India. 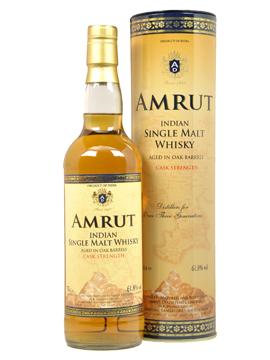 India has a massive whisky market, dominated by their own brands of blends. Much of what they bottle as "whisky" is actually an inexpensive distillation of molasses. BUT, Amrut Distilleries (est. 1948) now produces their malts according to the Scottish Whisky Association's standards. Now, as you can imagine, the weather in India is slightly different than that of Scotland. So the whisky matures differently. For instance the heavy heat causes the spirit to shed alcohol much faster than its Scotch counterparts. Thus the bottlings must be much younger. Finish: Here's the Heat, along with some spice. Perhaps it was the new tasting method, but the alcohol (62% of the drink) was not as obtrusive as other lighter cask strength whiskies I've had. It was very good. Blindfolded I wouldn't have known that it wasn't Scottish. ALSO, I have a my own mini bottle of this. So we'll explore this further, along with other world whiskies, next month. This may or may not be the right bottle pic. There are others with greener labels and the ABV stamped largely on the front. Adam and I chatted about Laphroaig's malts after I'd sampled this one. He helped diagnose my issue with the 18 year -- it's designed with a subtler palate range in mind. He's also a fan of the Quarter Cask. "Best nose in the range, but this has the best finish by far." This being the 10yr Cask Strength. I'll agree with him, this finish was unbelievable. It kept transforming as time went on. Looks like the Quarter Cask has a competitor here. These were all big individualist whiskies adorned with clomping steel-toed boot-style characteristics. Could we go any larger? What in the world would that be like? Stay tuned for Part Four in the series, coming soon.